is the first and best advertisement for your next one. Prepare these bulletins (SR-31A sheets or 8 x11 paper may be used) to show scores for each match, with competitors ranked from first to last in the order of their scores and listing the prizes the winners received. Send NRA at least two copies of the Official Bulletin, together with the appropriately completed Registration/Entry cards (or equivalent) and appropriate fees (these cards are not required for silhouette). 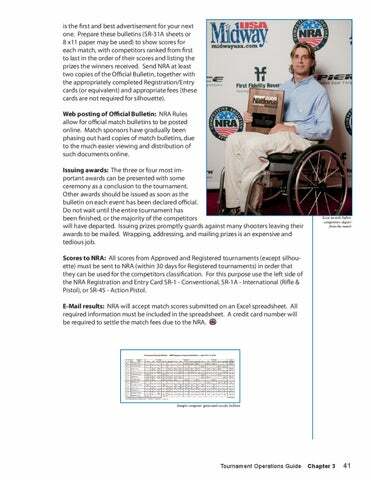 Web posting of Official Bulletin: NRA Rules allow for official match bulletins to be posted online. Match sponsors have gradually been phasing out hard copies of match bulletins, due to the much easier viewing and distribution of such documents online. Issuing awards: The three or four most important awards can be presented with some ceremony as a conclusion to the tournament. Other awards should be issued as soon as the bulletin on each event has been declared official. Do not wait until the entire tournament has been finished, or the majority of the competitors will have departed. Issuing prizes promptly guards against many shooters leaving their awards to be mailed. Wrapping, addressing, and mailing prizes is an expensive and tedious job. 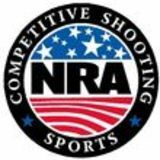 Scores to NRA: All scores from Approved and Registered tournaments (except silhouette) must be sent to NRA (within 30 days for Registered tournaments) in order that they can be used for the competitors classification. For this purpose use the left side of the NRA Registration and Entry Card SR-1 - Conventional, SR-1A - International (Rifle & Pistol), or SR-45 - Action Pistol. E-Mail results: NRA will accept match scores submitted on an Excel spreadsheet. All required information must be included in the spreadsheet. A credit card number will be required to settle the match fees due to the NRA.